We got up early this morning and rather than going on our planned bike ride, we immediately went out and mowed lawn. There was a storm bearing down on us, and even though the weather report said 0 chance of rain, we’ve been bit by that one before. Thankfully, as we mowed, the storm veered north, so we may be able to have the rest of our day for bikes and motorcycles as originally planned. But, I did grab a moment for spinning, as promised for my personal TdF. I finished a dyeabolical bump, called Wit Beyond Measure. It’s mixed BFL, and was an absolute joy to spin. Now I need to find time to pull out my wheel and ply. Bonus photo of some undyed and barely processed merino on a bossie. Hoping to get more of that done as well, though it’s a little less than inspiring! Gorgeous spinning, that Bossie is sure handsome with that fiber on there. So happy you all were able to enjoy the day! Your spindle looks so nice and neat. Mine is a lumpy sight. How long did it take you to get the hang of drop spindle spinning? PS glad the storm went away! 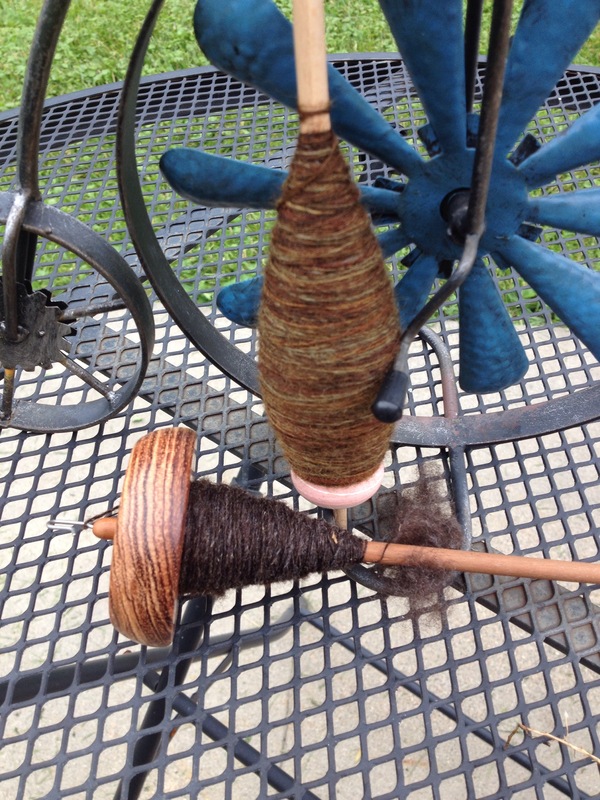 Not terribly long, but I was an accomplished wheel spinner before I began spinning on a spindle. It took a lot longer to become an accomplished wheel spinner! I always say the best thing is to just practice 10-20 minutes a day, every single day.